A delicious and well-seasoned southwest quinoa chili made easy in one skillet. This meatless dish will have your whole family (meat lovers included!) begging for more! Okay disclaimer time. I had NO clue what to name this recipe! Sometimes naming recipes can be hard, or, at least for me it can be. I’m just throwing together ingredients and tasting it as I go and all of the sudden I have something amazing (or not, but that’s a discussion for another day). But then comes the part where I have to (in so many words) try to describe the amazing taste or say what it is I’ve created. This dish was one I totally struggled with naming. One skillet and easy – well those words came easily because it perfectly describes the dish. This is done all in one skillet and is VERY easy! So easy in fact that it’s been lunch or dinner way too many times since I developed it. I’m talking like 4-5 times. Luckily no complaints yet; I guess it’s just that good 🙂 That and I have a baby that can’t complain yet and one hecka great husband. The rest of the name however, I didn’t know. It definitely has some chili flavors and chili beans, but I don’t know how much of a real “chili” this is. So I’m very sorry if you are expecting a traditional chili with this recipe, but it’s not so traditional. And then southwest – well there is some cilantro, fresh lime juice, and I added loads of sour cream (MUST DO!) so it definitely has a bit of a southwest kick to it. Okay so now that the name is out of the way, let’s just talk about the actual dish. First thing, it’s vegetarian. Technically vegan too depending on the additions you choose to add or not add. Although, I’m going to say it’s vegetarian because adding in sour cream is a huge must. It takes this dish from great to WOWZAS. Seriously, even if you aren’t a fan of sour cream you should at least try it 🙂 I always use fat-free sour cream and honestly can’t even tell the difference from full fat when it’s mixed into a dish like this one. 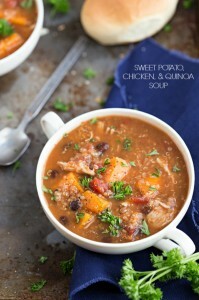 Next thing, I used sweet potatoes as the “base” of this dish and absolutely love them. They get soft and tender and go so well with all the other ingredients. However, you could definitely try subbing in some squash (I’d recommend butternut) or maybe even some chopped pumpkin. Other ingredients include chili beans (yum, yum! ), diced tomatoes, corn, and of course quinoa. I always rinse the quinoa off before adding it to remove the natural coating (it’s called saponin) which sometimes can make the quinoa taste bitter. To rinse the quinoa I’ve found the easiest way is in a mesh strainer – no quinoa lost this way! You are going to wish Meatless Monday was every day of the week with this one! In a large skillet over medium high heat add in the (peeled and chopped) sweet potatoes with the olive oil. Stir until quite tender, around 7-9 minutes. Stir in the chili powder, ground cumin, cayenne pepper, onion powder, garlic powder, salt, and pepper. Thoroughly rinse the quinoa. Remove the skillet from the heat and add the quinoa to the hot skillet stirring constantly for 30 seconds. Return to the heat and add in the broth, the frozen corn, undrained chili beans, and undrained petite diced tomatoes. Stir everything well and bring to a boil. Once it is boiling, reduce the heat to medium low and cover the pot. Allow to simmer for 20-25 minutes or until the liquid is absorbed. This time will vary depending on the heat of your stove-top. For best results, check it every 3-5 minutes and give it a good stir at each check to avoid burning or sticking to the bottom. Once the liquid is absorbed into the dinner, remove from the heat. I absolutely love all of your quinoa recipes, Chelsea! And I think you named this one perfectly! 🙂 I love the southwest flavors in this dish. Sounds delicious! Pinned! URGH. I hate naming dishes sometimes! My titles are always way too long haha! I LOVE the sweet potatoes and quinoa combo here girl. Its comforting and healthy…in one skillet! WIN. Pinned! I seriously sit there sometimes just pondering on how to name the dish that people will understand yet want to eat! This dish sounds perfect for a Friday night dinner! 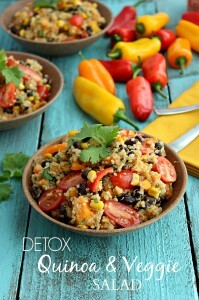 I’ve got so many of your quinoa recipes pinned, It’s going to happen once the weather cools down! I love quinoa! Easy recipe with awesome flavors! What would you sub in for corn/Sweetcorn in your recipes? My husband really genuinely dislikes it so I try not to force him to pick it out… And you confused the heck out of me as a European reader… Cilantro!?!? I spent ages checking a few shops for it fresh & dried with no luck, then I googled to see what it looked like & it told me cilantro is Spanish for Coriander *doh* now I know and will be trying as many of your recipes as I can (although some are hard given the availability of some ingredients). I would try substituting another similar vegetable. Cutting up carrots small would give a sweet touch to replace the corn. Peas are also a great option in some of my dishes. SO sorry I confused you with cilantro!! That’s what it’s called in the states so I’m so sorry for the confusion, but glad you figured it out! 🙂 Hope you love these recipes! I loved this recipie! I have tried a few from your website! I was wondering if you had an estimate of calories per serving? I like to know for tracking, and homemade meals are so difficult sometimes. I made this yesterday! I was skeptical about the sweet potatoes but so glad I tried it! It was awesome! I added lean ground turkey and chopped green onions. Yummy! Thank you! I made this recipe last night and loved it! I wasn’t sure what you meant by “chili beans:” did you mean the chili beans that are mild or hot and come in sauce, or kidney beans? I assumed you meant the latter since you rinsed them, so I used black beans instead since I had them. I also used an 8.5 oz can of corn instead of frozen since I didn’t want to buy a bag just to have a bunch left over. I used more sweet potato than called for (mine was HUGE) and less quinoa since I had less than I thought. Still turned out great! The spices were pretty spot on, though I added a pinch more salt and cayenne. I’ll be saving this one!